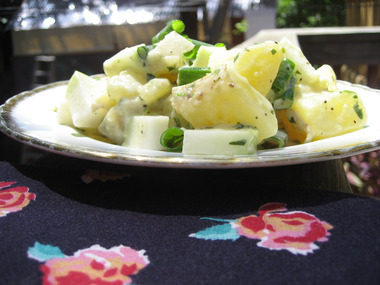 Creative ways to use kohlrabi: throw it in potato salad!This recipe/idea is surely not sole property of my imagination (and refrigerator presently consumed with slowly rotting vegetables and produce), but I don’t have the time to reference all the cooking greats (Irma and Google). Alas, I’ll post my lunch and let you decide if it’s widely-known, or as new to your house as ours. I tasted kohlrabi for the first time last week when it arrived in our CSA share. I love Doris & Jilly’s recent adventures with this non-root-veggie in her garden (I didn’t realize the bulby part grew above ground!! ), and I’ll add that the taste/texture is somewhere between a cabbage, apple and turnip mixed together. Really, my lunch plans were spurred mostly by the need to use up 3/4 cup of homemade cilantro mayonnaise made yesterday to accompany our fried squash blossoms. J doesn’t like mayonnaise. Though I’d hoped to sway her opinion via homemade, my efforts were to no avail. It’s up to me to eat it all. 1/3 to 1/2 kohlrabi bulb raw and diced to your preference, I left skin on and all. It’s important to note that there’s a thick, stringy core lining the bottom of a kohlrabi, so slice off enough of the bottom to get it out of the way.